These days London’s Soho streets are not so mean. The faint undercurrent of corruption still lingers, but now it involves property speculators, not spivs and bookies. Once, though, London low-life writing involved getting in with the wrong people, rather than just hanging out in media clubs. The Jewish writer Gerald Kersh was the real deal, a bodyguard, all-in-wrestler and cinema manager for whom fighting and rough-sleeping was a way of life, and writing was as necessary as breathing. Kersh was buried by a bomb in World War II but bounced back as a quicksilver talent, writing short stories for the Evening News one day, producing character sketches, columns, articles and radio scripts the next. His wonderful short stories – which included a tale about a pilot who ages backwards and the Mona Lisa smiling to hide her bad teeth – were sometimes accepted as factually accurate. In these tales, which embraced every possible genre, resided his fame – but he should really have been lauded for ‘Fowlers End’, about a venal, hilariously Falstaffian cinema owner. Most critics ignored this masterpiece, although the ever-perceptive Anthony Burgess pronounced it one of the century’s finest comic novels. Kersh’s ‘The Thousand Deaths of Mr Small’, is about a man held back by all that he learned as a child. One by one, Mr Small’s hopes of achievement are removed until he is left immobile. Kersh himself achieved a lot, but his rambunctious life, punishing working hours and natural nostalgie de la boueusually left him on the run from creditors or in hospital. Which brings us to his finest hour and a half. The hero of ‘Night And The City’ is a tough-talking Soho loser who is doomed from the outset, a Soho pimp who fancies himself an American gangster. Harry Fabian is unlikeable and self-deceiving. He steals the savings from his kindly girlfriend, who works at The Silver Fox nightclub as a singer but is sliding towards prostitution, and when he cons his way into the wrestling racket he angers Soho’s kingpins. Although he fails to improve himself, the book has a strong moral viewpoint. There were two film versions. 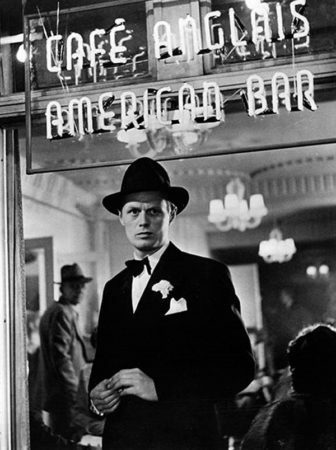 The first one is a noir classic, and stars Richard Widmark, directed by the great Jules Dassin. Although it’s less gritty than the very bleak book, it perfectly catches the night in postwar London, still pockmarked with bomb sites. Packed with seedy characters grubbing their way through life by cheating each other, it feels Dickensian, especially in the character of Figley, who runs a gang of beggars. There’s a terrific scene where a mobster puts a price on Harry’s head by alerting his contacts. It shows him driving in an open-topped sports car through the West End at night, stopping at street corners to tell his informants of a reward. You get the sense that the whole of central London was part of an underground network. And we have to remember that in some ways it was; with the crippling bill for American’s help in the later stages of the war preventing any rapid rebuilding, and the lack of availability of everything but essentials, a black market thrived that corrupted even the most innocent in small ways, from luxury goods to food rations. Harry takes his revenge by fleecing the naive Americans who drift onto his patch. The film is a darker nighttime version of ‘The Small World of Sammy Lee’, which Anthony Newley races around Soho trying to raise the cash that will prevent him from being razored. Part of the film is shot in Goodwin’s Court, the funny little alleyway off St Martin’s Lane which used to be presided over by acting twins who always played Santas at Christmas. This is London in transition, at its crumbling street-dark nadir, where the underclass was largely left to get on with it, to the glimmer of a renaissance – the foundations of the Festival Hall can be seen being constructed in the film. There are two different versions of ‘Night and the City’ for the UK and the US releases. The second is Americanised, with a different score, more US accents and many alternative scenes (both cuts are presented on the BFI disk). But the sense of unstoppable doom-laden fate remains in both. There was also a 1992 Hollywood version with Robert De Niro, set in New York, that completely missed the noir mark. When he died in 1968, Gerald Kersh left behind a canon of stories and novels filled with a dazzling gallery of criminals and artists, characters filled with love and loathing, carrying the seeds of their own destruction. It’s a mystery as to why he is not regarded as a great British writer of the 20thcentury. The next Bryant & May novel, ‘The Lonely Hour’, takes place in London at night. Harlan Ellison always named Keyshawn as his favorite writer and edited a collection of his stories. It’s because of him that I was introduced to Kersh who is now one of my favorites too. And Goodwin’s Court is where John Lawton’s Inspector Troy lives throughout the war. 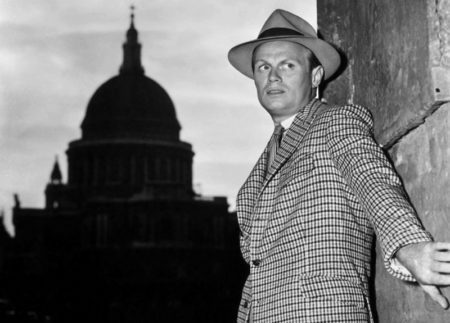 Nothing to do with Richard Widmark. Just read Old Devil Moon and googled all the Old Friends. Thank you Christopher for leading me to their faces. I loved them too.